The concept of blood donation is a very good one. It saves a life of a person and it needs no other explanation than that. The blood donation can be tolerated by all the people. It does not cause any major complications in the majority of the cases. But in less than one percent of the cases the people will be traumatized by many problems that may be a real threat. But they will linger for some time and vanish. These side effects are just the symptoms to trigger the loss of the blood in the human body and nothing else. Therefore the people are advised to drink beverages or eat foods when they are donating the blood. This will help them to replace the blood that is being donated out to the others. It is a very simple strategy. But the occurrence of the side effects due to the blood donation is very real and can never be denied. The level of the intensity of the side effects too will also vary from each person. If there had been no risks then the people would not have made a fuss over it. It has been said that 2 percent of the 6000 donors will experience the side effects from the blood donation. Among the one percent of the donors who get affected by the negative reaction, the majority of the side effects are categorised as minor problems. These meagre side effects are externally localized skin problems caused due to the improper use of the needle. The bruise gets resulted if the inserted needle passes through the veins. It will result in local bleeding beneath the skin thus forming a bruise. This is clinically called as hematoma that will generally be resolved after a few days. The clotted blood will break down and thus it is removed. The other typical reactions that are caused by blood donations to the donors are feelings of tremors and loss of consciousness. There are certain donors who will experience other side effects like increased sweating, paleness of the body, extreme cold feeling, fatigue and nausea. Generally these side effects will happen immediately after the blood donation. Uncommonly, these side effects will advance to the problem of light-headedness. It has been said that the feeling of faint is a very minor problem that will pass away in some minutes after the blood donation. But very rarely, these fainting symptoms can advance to real loss of consciousness. In a reputed study done by the Doctors Crococ and D’Elia it was proved that only the blood of the four donors from a maximum of about 5000 were deemed as grave. These donors felt some adverse reactions such as vomiting and feeling of unconsciousness. These were felt temporarily because of the low levels of the oxygen that was circulated to the brain. The muscle spasms were also felt. There were also some injuries that resulted indirectly due to the loss of consciousness. The people who fell became very seriously affected by the physical problems than the psychological problems caused by the blood donation. There was also another study that analyzed many as over as 155000 blood donation samples that were done by teenagers throughout the nine Donation Centres of American Red Cross Society. The teenagers contribute to about eleven percent of the entire blood donation as per the American Red Cross reports. 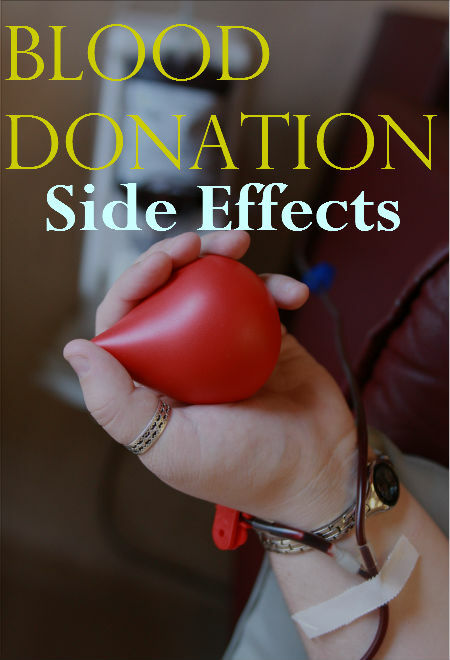 In that only four donors in just hundred were found with side effects. The remaining ten percent of these adverse effects were felt in the seventeen year old youngsters. The twenty year old people who felt some trauma were about 3 percent. But this research was not able to explain this difference due to the ages that resulted in the people feeling some side effects due to the blood donation. The adverse side effects that were found in the people who donated the blood may be reduced by drinking more quantity of water before donating the blood. It is also good to eat a well-balanced food prior and after blood donation. Sometimes having plenty of sleep on the night prior to donating the blood will also help to some level. Night prior to donating the blood will also help to some level. As the heading goes it is a very retarded form of the acute reactions of the immune hemolytic. The body will tend to destroy the red blood cells so gradually that the problem will often become unnoticed till the level of the red blood cells becomes very less. It has been said by the doctors that both the acute and the delayed hemolytic reactions are generally common in the people who have undergone the transfusion previously. Some people are very prone to be affected by the instance of the sudden fever while or after a day of the blood transfusion. It is generally the general response of the body to the level of the white blood cells in the blood that was donated. Fortunately there are some medicines that will help to treat the fever. So to be precautious there are certain blood banks that will remove the white blood cells from the entire blood or the various parts of the blood. Thus it is made very less likely to be affected by the adverse reactions post the blood transfusion. The frequent receiving of the blood transfusions will generally result in the increased accumulation of the iron in the blood. This is also called as the iron overload. The people who have been diagnosed with the blood problems such as thalassemia, that will need many amounts of the blood transfusions, are at a high risk of the problems caused by the iron overload. This condition of the body will also damage the heart, liver, heart and other organs of the body. If the people are affected by the iron overload or the hemochromatosis as it is medically called as, then they may need to undergo the therapy by the name of iron chelation. In this therapy, the medicine is injected by an injection or also given as a tablet to extract the increased iron that is present in the body. It is very unlikely for the blood transfusions to damage the lungs, rendering the person to be very hard to breathe. It only occurs within the first six hours after the procedure. Sadly most of the patients will never recover. But, about 26% of the patients who have developed the lung injuries only die Succumbing to the injuries. These people might have been very ill prior the blood transfusion. But the doctors are not very sure about the reasons for the blood transfusions to affect the lungs. The proteins that are present in the plasma of the women who are pregnant will alter the normal way the dells of the lungs function. Due to this risk, the hospitals have begun to use the blood of the plasma of the men and the women very uniquely. This is a very serious problem. But to be very happy this is also very rare. This occurs when the type of the blood obtained during the blood transfusion does not match or function with the type of the blood. The body will attack the newly formed red blood cells that will produce the substances that can affect the kidneys in the worst way. The signs can include feeling of chillness, very high fever and sensation of nausea, pain in the middle of the chest or at the back and very thick colored dark urine. Immediately the doctor will halt the blood transfusion at the very first symptom of the problem. This is a condition where the white blood cells in the donated blood will start to attack the tissues. This is usually very fatal. The people who have very bad immune systems are most likely to be affected by the problem of GVHD. These symptoms will begin start from the month of the transfusion of the blood. The symptoms are high fever, formation of skin rashes and finally diarrhea. To safeguard oneself from against GVHD, the people with the weakened immune systems must obtain the blood without the white blood cells. There are some infectious diseases like HIV that will survive in the blood and infect the person who gets the blood transfusion. To maintain the blood safe, the blood banks must screen the donated blood very carefully. But the risk of being affected by the virus from the blood transfusion is very less. The risk of being affected by the HIV due to the blood transfusion is less than the risk of being killed by lightning. It is said that only one in two million donors will carry HIV infections. The risk of passing the Hepatitis B is one in 250000. The risk of Hepatitis C is one in two millions. Variant Creutzfeldt-Jakob disease is the human form of Mad Cow Disease. It is a fatal brain problem. The possibility of being affected by the risk of Variant Creutzfeldt-Jakob disease by the blood transfusion is very less.